The co-channel season is here. The sun will be at the stormiest phase of its 12-year cycle. Whether your system has been hit by co-channel brownouts and rolling blackouts, or the co-channel season has not reached the area, Biro Engineering offers a three-step co-channel interfer-ence protection plan for your consideration. A computer aided co-channel interference study. Prepared for the system's antenna-site, it will show channel by channel all potential interference sources within a 400 mile radius. And those at-tractive Co-channel Signal Direction Sheets were not included to prove artistic quality. The theoretical study has a shortcoming, due to hilly terrain and weather related wave propagation conditions. A study can only project co-channel difficulties. Positive identification of the primary and secondary interference sources require an on-site verification survey. Even properly designed phased-arrays can generate disappointing results if the arrays were incor-rectly assembled, and only compass-oriented by the tower crew. The preassembled antenna-arrays should be checked on the ground before lifting by the tower-crew. The orientation of the arrays should be directed by an expert engineer, using sophisticated instrumentation. Before conducting any meaningful co-channel verification testing, the CATV technician should know in advance which are the potential offenders. These days, computer generated and printed studies list with incredible speed and accuracy all potential co-channel interference sources within 400 miles. The accuracy is better than 1/100 mile for distance and 0.1 degree for direction. The design of interference rejecting phased-arrays require that level of accuracy. Some suppliers still use "pioneer" methods. The results are often less than satisfactory. A frequent misconception is the distance of the undesired TV stations. It should not be estimated with the aid of a road atlas. Electromagnetic waves propagate in great circle mode, the shortest possible path between two points on the globe. 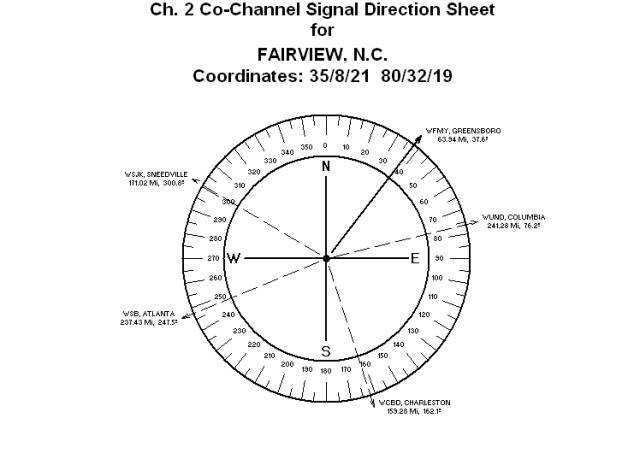 The distances calculated for the Fairview, N.C. antenna site are exact to 1/100 of the mile. The Azimuth Angles, their direction from the true North, to 1/10 of a degree. Compare our information accuracy with those of the "free" signal sur-veys. The fact that 33% of the US TV stations are offset by +10 kHz, and 33% of the stations operate with -10 kHz frequency offset, makes co-channel offender identification possible and practical. 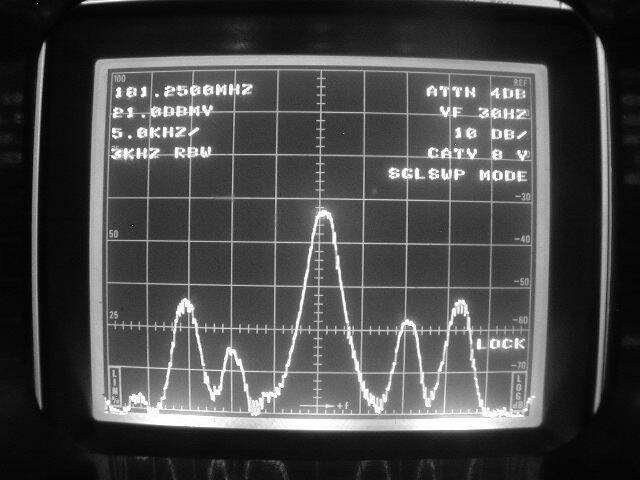 Namely, the offset created ±10 kHz and ±20 kHz beats are clearly visible on the screen of the spectrum analyzer. The rotation of the search antenna will change the amplitude of the beats. Note the -10 kHz beat (two divisions to the left of center) and the +10 kHz beat (two divisions to the right) on the screen of the analyzer. The +10 kHz beat was consistently 5 to 8 dB higher, resulting in positive interference source identification. The Computer Aided Co-Channel Study was completed for the antenna site, followed by an on-site Verification Survey, and culminating in the proper antenna array design. Unfortunately, there is still a possibility for poor interference rejection. Observe the computer generated phased-array radiation patterns below. The nulls are narrow and deep, meaning that the orientation of the array can make all the difference between moderate (20 dB) or excellent (40 dB) interference rejection. An antenna array should be never installed on the tower without first checking the completely as-sembled unit on the ground. The orientation should never be handled by the tower crew without the firm guidance and control of an experienced engineer from the ground.